UPDATE 5 March 2017: Unfortunately this restaurant has closed indefinitely, I am very sad about it too. I have chosen to keep this blog post online to remember such a legendary Thai restaurant in Bangkok. 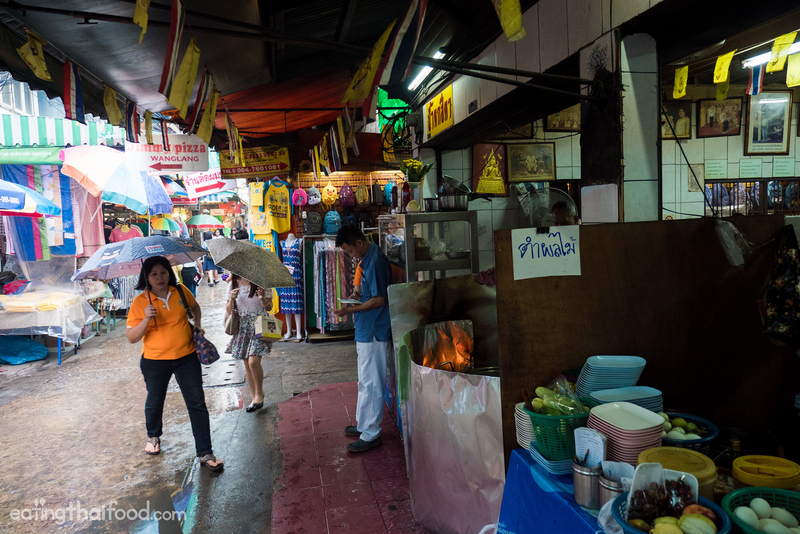 One of my favorite markets for food in Central Bangkok is Wang Lang Market (วังหลัง). 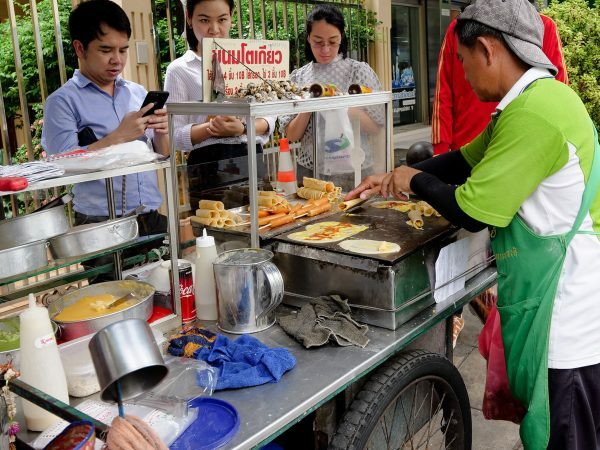 There’s such a good variety of both street food snacks, and sit down local places serving southern Thai food to sizzling oyster omelet restaurants crammed into tight alleys. 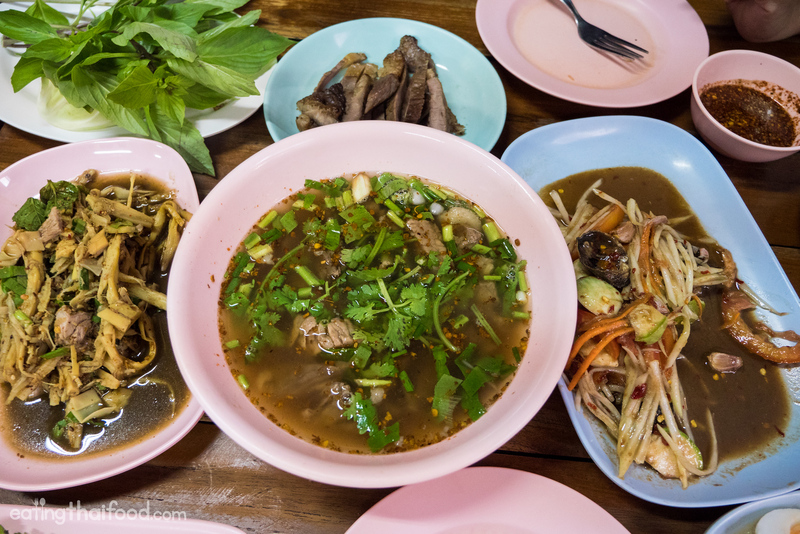 Wang Lang Market is a full Bangkok eating paradise. 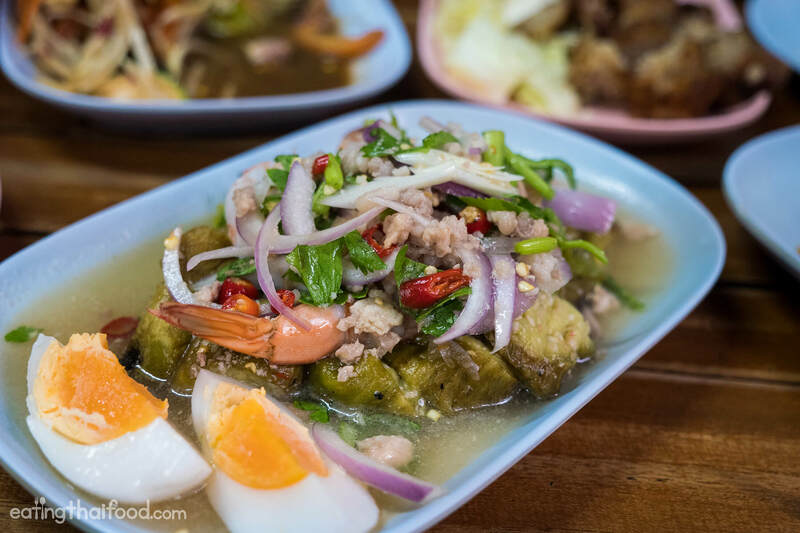 One of the restaurants I’ve been going to for years, but have just now gotten around to writing about, is Som Tam Sida (ส้มตำสีดา) – an excellent Isaan restaurant. 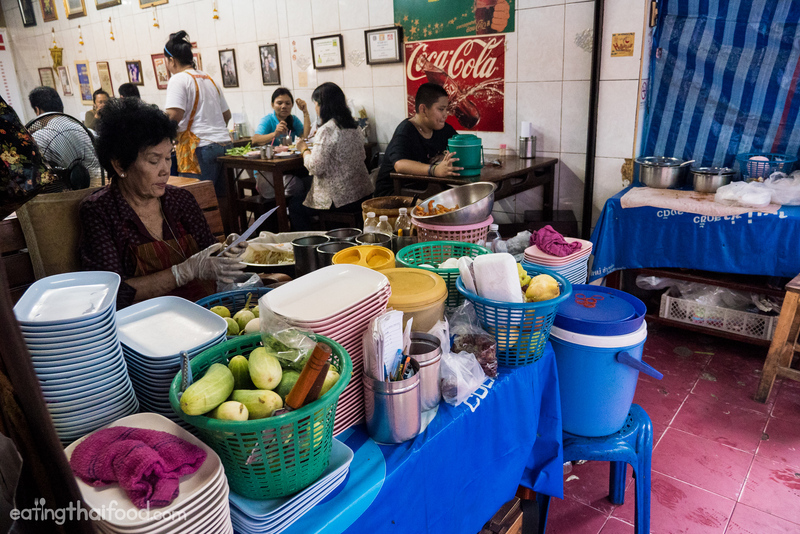 Open for over 50 years within the walking street of Wang Lang Market, Som Tam Sida (ส้มตำสีดา), is a famous restaurant where you can grab a seat and take a break from the crazy shopping alleys of Wang Lang Market. I don’t think they have an English menu, but they have the full spectrum of Isaan dishes including all types of green papaya salad and grilled meats. Grandmother at the front of the restaurant is in charge of pounding the green papaya salad, and she does it with expertise. Her son and other family members take care of the rest of the dishes. So I made sure not to ask her any questions while she was expertly tossing the ingredients into the mortar. What I love about Som Tam Sida (ส้มตำสีดา), just like many other Thai restaurants, is that it’s still family run. 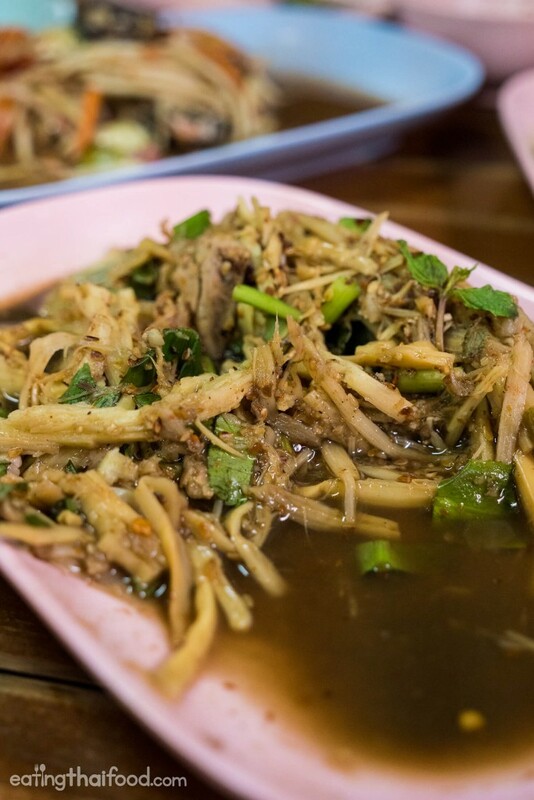 Having an Isaan meal without green papaya salad wouldn’t be complete. And I ordered my typical favorite version, som tam boo pla ra (ส้มตำปูปลาร้า), with fermented fish and crab. The owner, made sure to tell me that they really take health and hygiene seriously, and they boil and make sure the fermented fish sauce is safe to consume. The Grandma at Som Tam Sida (ส้มตำสีดา) made no mistakes on the green papaya salad. The papaya was fresh and crisp, and the taste was pungent and spicy, with just a tiny sweet tinge. 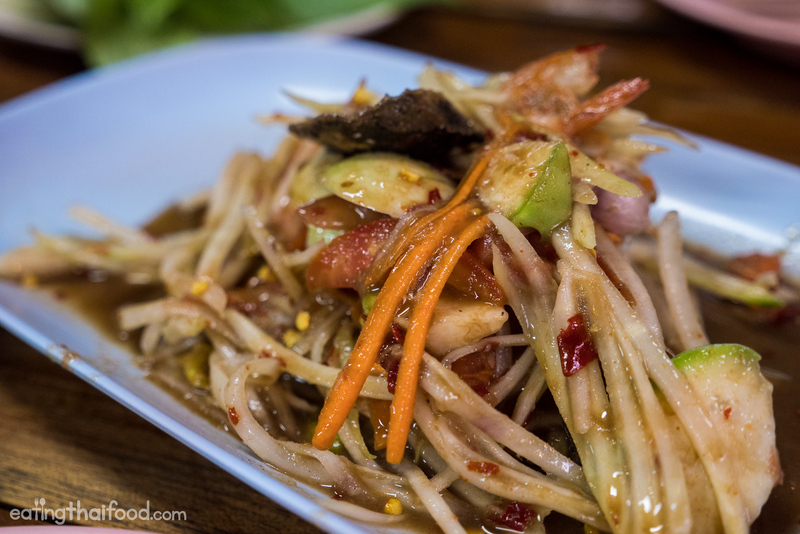 Additionally, they used good quality dry shrimp in the som tam as well. 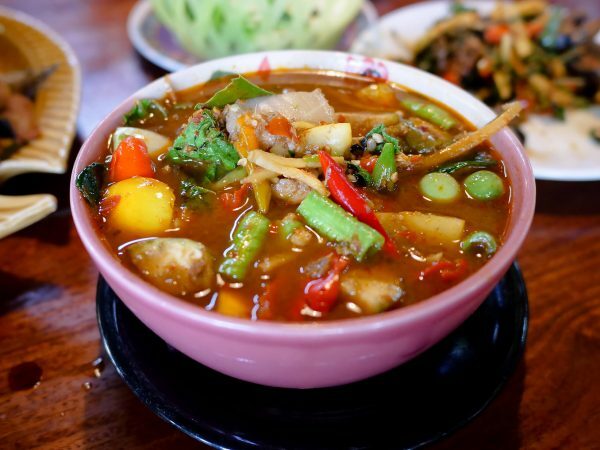 We also ordered a bowl of tom saeb neua (ต้มแซ่บเนื้อ), a common Isaan soup. It was one of those bowls of soup that when you take your first spoonful, it makes you kind of shrivel and close your eyes, because it’s so sour and spicy and flavorful. 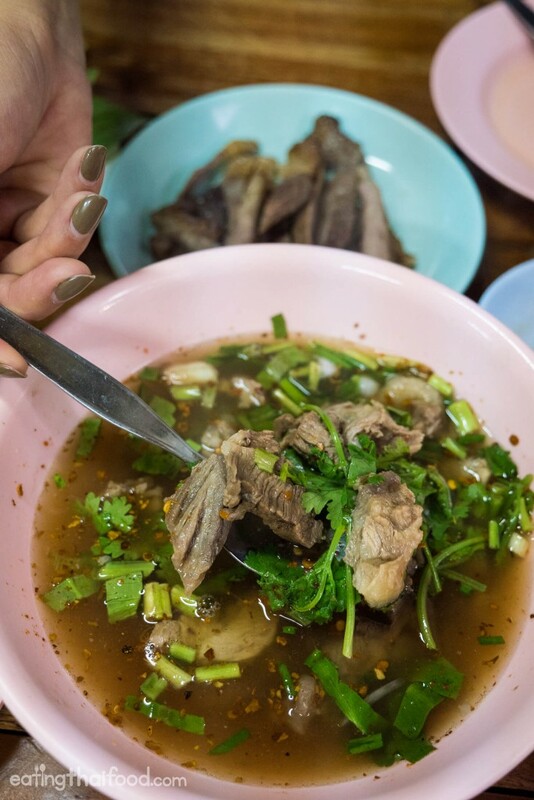 It was my kind of a tom saeb neua (ต้มแซ่บเนื้อ), and in addition to being perfectly sour, I loved how they tossed in a good handful of both green onions and cilantro to top it off – and they were still half raw so they were crunchy and full of earthy flavor to go with the beef broth. The soup also had a lovely dry chili flake flavor to it. 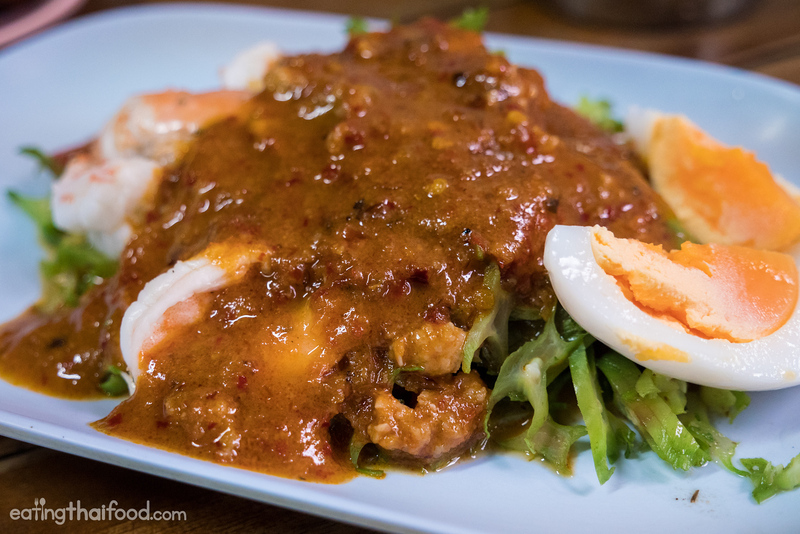 If there’s just one dish I can’t miss at Som Tam Sida (ส้มตำสีดา) it’s laab pla duk (ลาบปลาดุก) – it’s been a favorite Thai dish of mine for a long time, and they do it incredibly well here. It all begins with a smoked / grilled catfish, that is deboned and minced, and then mixed with all the typical ingredients used to make laaab meat salad. What I love most about the laab pla duk (ลาบปลาดุก) here is that it’s prepared dry. Some versions can be too moist, but here it’s dry and has a marvelous smoky fish flavor. If you come to Wang Lang Market, this is one of my favorite dishes. Soop nawmai (ซุปหน่อไม้), a bamboo shoot salad, is yet another dish they do excellently well at Som Tam Sida (ส้มตำสีดา). The bamboo shoots were crisp and tangly, and the salad included a hint of pla ra (fermented fish sauce), and a bunch of raw garlic and green onions. It had a bit of a pungent and fishy flavor, so you have to like that kind of thing. And if you do, you’ll love this dish. Yet another winner off their menu at Som Tam Sida (ส้มตำสีดา) was the tam makua (ยำมะเขือยาว), their roasted eggplant salad. 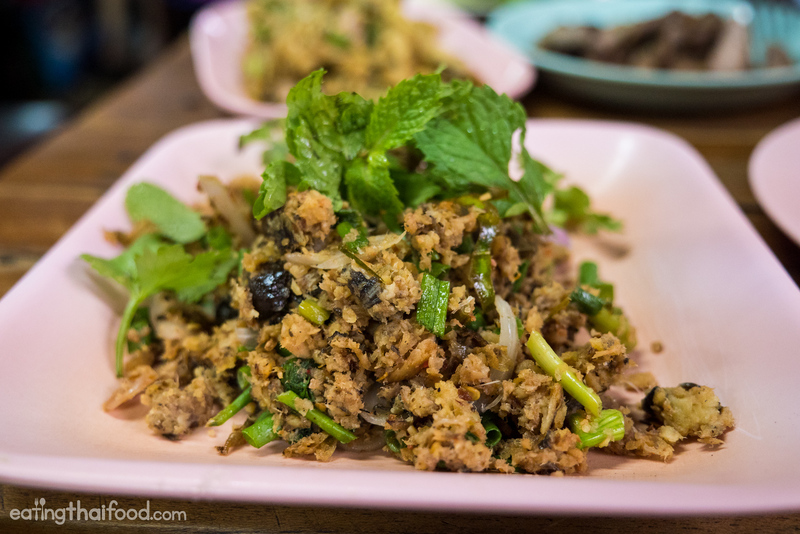 Their version included roasted eggplant cut into bite sized pieces, then mixed with a bit of minced pork, some shrimp, and a good amount of crushed chilies, shallots, celery, and then a half of a hard boiled egg on the side. The dressing was nice and tangy, not too sweet, but well balanced. Good ingredients, and a great taste. And additionally, it had an almost unbelievably smoky flavor from the eggplant that came a couple seconds after taking a bite. For another salad we ordered yam tua pu (ยำถั่วพู), winged bean salad, and it was my first time to have this dish at this restaurant. It was unique here, different from many other typical versions found in Bangkok. 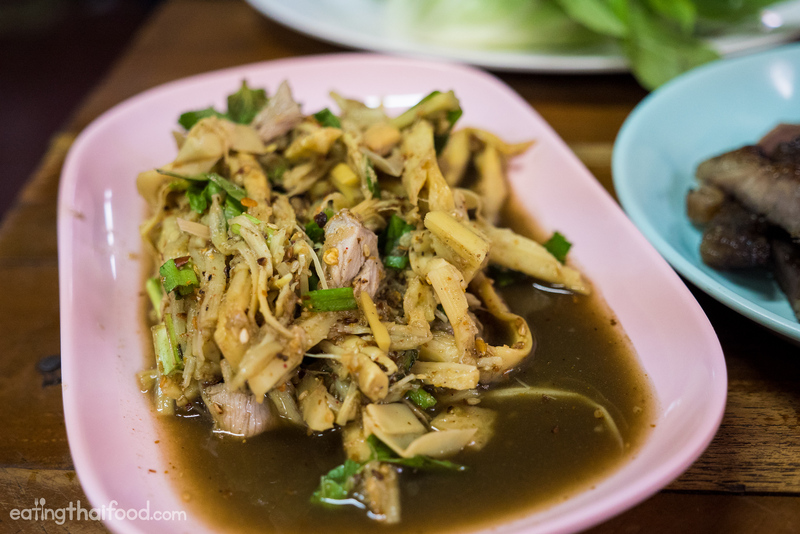 Most of the time Thai winged bean salad has kind of a sweet and sour sauce to it, but this one was really peanuty – the sauce actually tasted like satay sauce. Also included in the yam tua pu (ยำถั่วพู) were big shrimps and a couple slices of hard boiled eggs. Overall, it was quite good, and I enjoyed it. 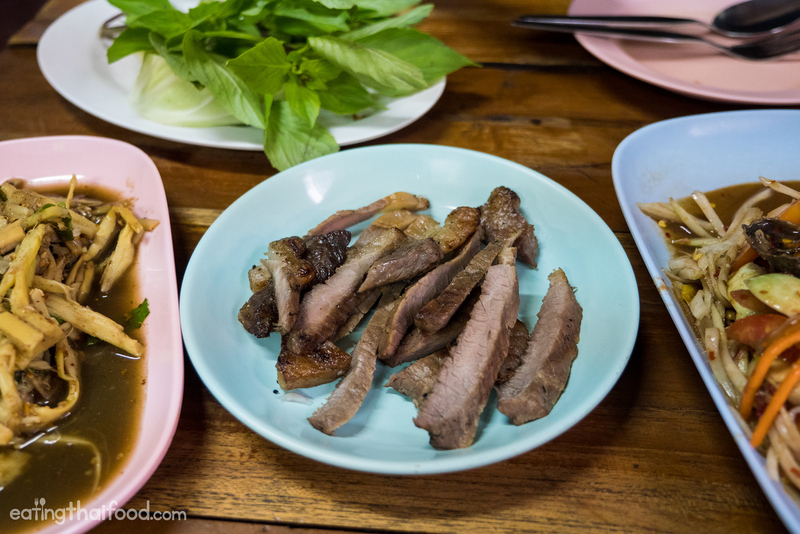 The only dish that didn’t really do it for me in this meal was the seua rong hai (เสื้อร้องไห), grilled beef. It could have been the piece I was given, or because I took so many photos and the beef got cold – but it was dried out, a little tough, and not the best. 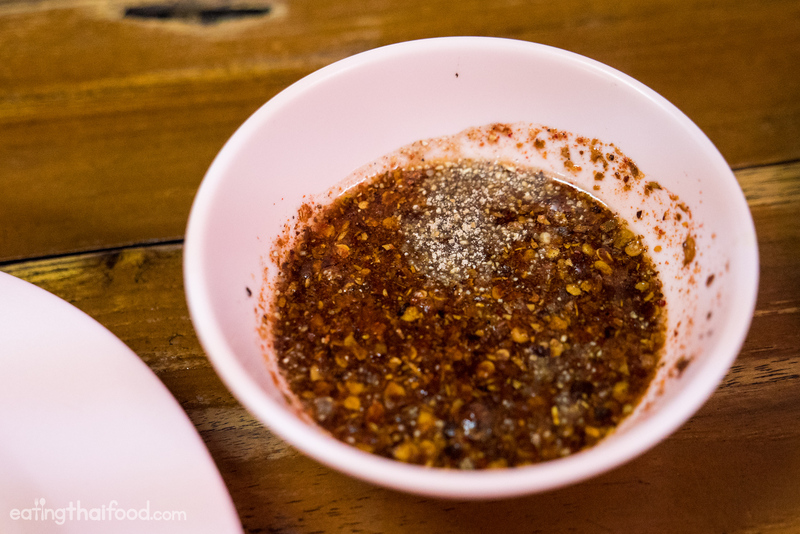 However, the nam jim jaew (dipping sauce) was excellent, with a great dry chili flavor, salty, and not sweet at all, and with a good fresh khao khua taste and crunch. 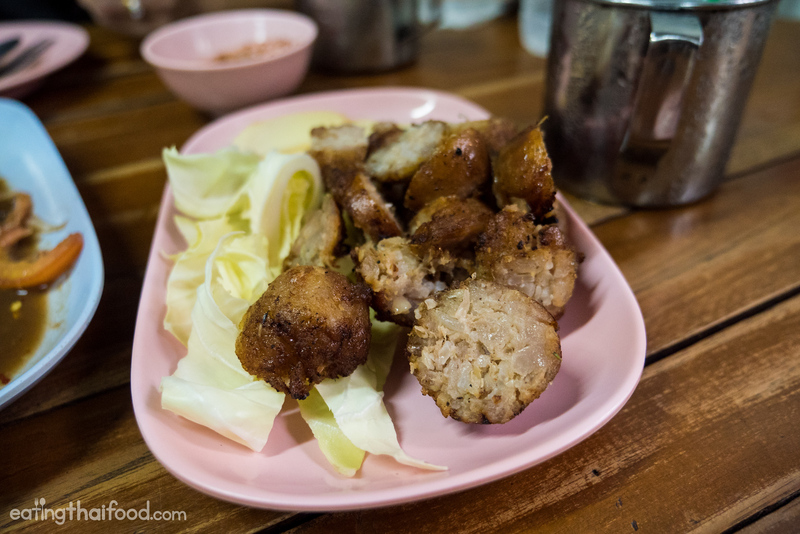 Another dish Ying and I order every-time we eat at Som Tam Sida (ส้มตำสีดา) at Wang Lang Market is the sai krok Isaan moo (ไส้กรอกอีสานหมู) – Isaan style sausage. Addmittedly, it’s a little on the oily and fatty side (ok, very much so), but it tastes so good. The sausage contains rice and pork, and what I love about it most is that it’s nice and sour, and goes so well together with pieces of raw young ginger, chilies, and cabbage. Som Tam Sida (ส้มตำสีดา) is a long-standing Isaan restaurant tucked into the walking alley of Bangkok’s Wang Lang Market. 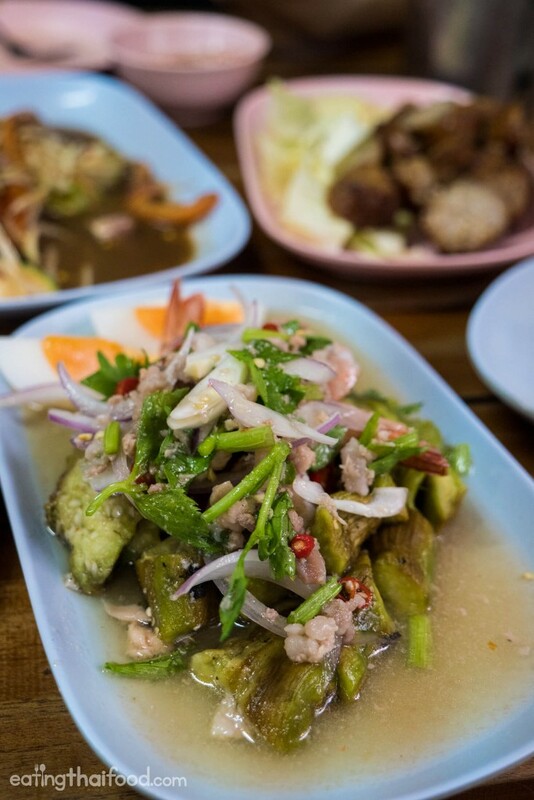 The restaurant serves up just about every type of Isaan dish you can imagine, and nearly all the dishes I’ve tried here over the years have been delicious. I especially love the Grandma at the front who handles all the som tam (green papaya salad) pounding. 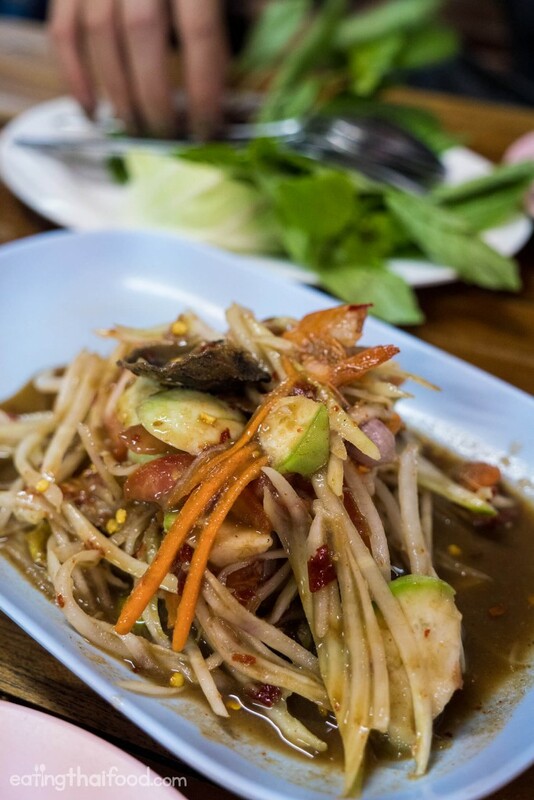 One of my favorite dishes at the restaurant is laab pla duk (ลาบปลาดุก), grilled catfish salad. If you’re exploring Wang Lang Market, and need to take a seat and a break from all the snacking (and by break I mean sitting and eating instead of standing and eating), Som Tam Sida (ส้มตำสีดา) is an excellent restaurant for an Isaan feast. How to get there: Som Tam Sida (ส้มตำสีดา) is located right in the middle of Wang Lang Market, and it’s a walking street. The easiest way to get there is to take the Chao Phraya River boat to Wang Lang Pier, navigate your way to the alley that is parallel to the road, walk about half way down the alley, and it’s on your left hand-side. 20 comments. I'd love to hear from you! Last year I have been to this Som Tam Sida, good food really. This year I would like to go to bangkok again, but I saw in Google that this Resto is permanently close already . Any best resto around Wang Lang we can visit ? 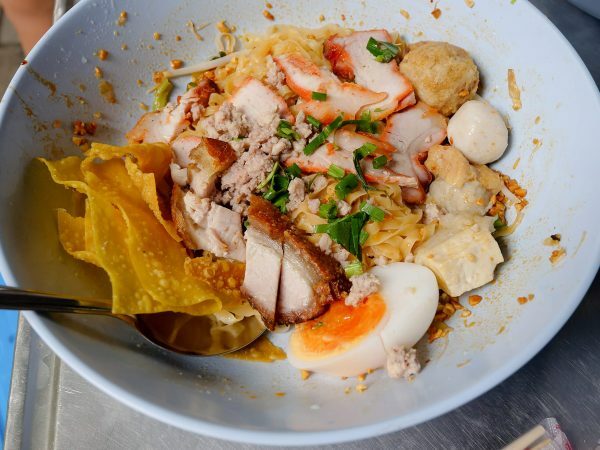 or Isaan food around bangkok ? Hey David, thanks for sharing. I just got word that they have closed permanently as well. Very sad, this was one of my go-to restaurants in Bangkok, and a legendary restaurant. we went there a few weeks ago 3 times in a row, it was that good.Got through over 350bts worth each time.Its good value,we ate a lot.Thought the sausage was one of the best we have ever tried. Awesome to hear that Timothy, glad you enjoyed it! Hey Mark! Thank you for all your tips on great food. We have enjoyed watching your videos and reading your blog for many years. I have been a huuuge devourer of laab for most of my life, but I was wondering if you’ve ever seen laab moo krob(?) in BKK? I stumbled across it in an Isaan restaurant in Queens, NY many years ago but have not seen it anywhere else! I’d appreciate any leads! We checked this Restaurant out this week based on its inclusion in your “two weeks” videos Mark. And wow. Just wow. Thank you so much for finding this eatery and telling us about it. We’ll be back in Bangkok next week, and plan to eat here again. The Som Tam was exceptional. I should mention that the staff were also very friendly. Hi Steve, thank you very much, awesome to hear you ate here. I agree, the staff are very friendly! I went there today and I can vouch (though I’m no expert on isaan food) that this place is great. I had the chicken, the eggplant salad, some sticky rice and a side of vegetables. Everything was tasty and fairly cheap. Will definitely go back again. Many thanks to you Mark, for all the restaurants suggestions on this website, so far they never failed me. Hey David, glad to hear you made it here and that you enjoyed the food! Ive seen tons of your videos and they are the best. Thanks for sharing. the Isan restaurant when we go to Bangkok in April this year. Ive tagged some of your videos on my website. Hope its ok.
Hi Kim, thank you very much for watching, and appreciate your sharing as well. Thank you! Made it here a couple of days ago; another great recommendation of yours. Laab Pla Duk was delicious ! Super juicy Gai Yang ! I think my favorite though was the smokey aubergine salad; a revelation. Again Mark I have to say that your guide came to the rescue, especially when faced with a paper menu written in Thai. Being able to draw upon a list of Issan options makes this type of local establishment really accessible. Thanks again for sharing your knowledge of this beautiful country and it’s sublime food. 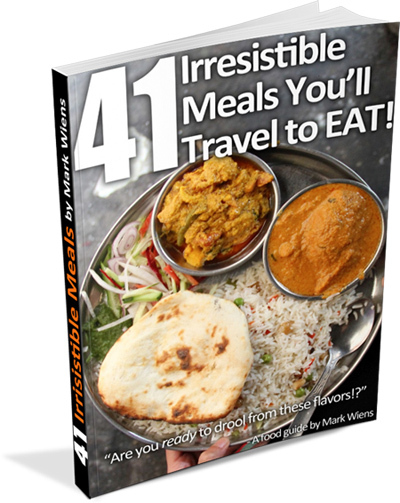 Mark’s guides are quite frankly the best of their kind – wholeheartedly recommended ! Hey Andy, thank you very much for your kind words, really appreciate it. Glad you enjoyed the food at Som Tam Sida as well. That aubergine salad is incredible! Hey Damien, glad you love laab pla duk as well. Thanks! 1) LOVED this post! 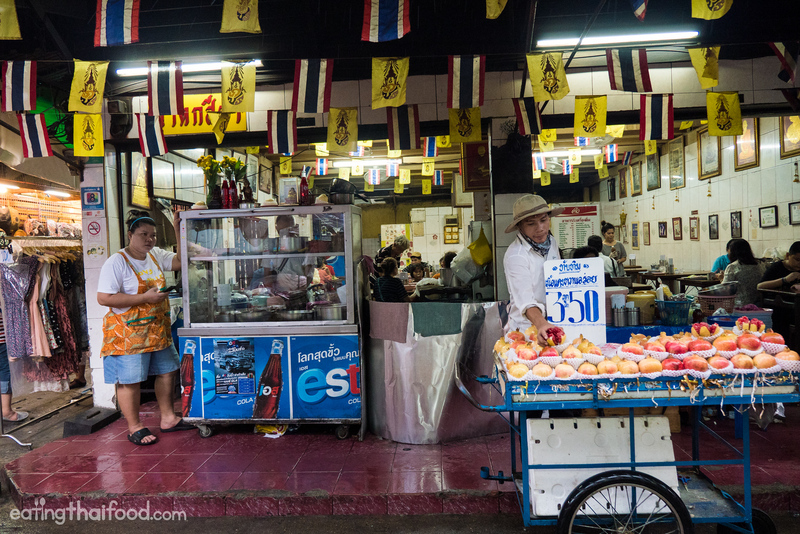 I’m headed to Bangkok in April and cannot wait to hit the street food stalls! This place will top of the ‘to-eat’ list! The som tam and eggplant salad look especially delicious! 2) Congrats on the youtube series- #2weeksinBangkok. I’ve been a loyal follower for a while now and I’m so excited that its finally released! I’ll be tuning in every night from melbourne! Hey Jenn, thank you very much. The eggplant salad was fantastic. Thank you, really appreciate your support!